Prominent Kentucky attorney, David Leightty, Esq. and Alison Messex, Esq., have drawn from their extensive experience to bring you strategies and forms for virtually every employment situation you or your client may encounter, from the hiring process to the termination of an employment relationship, to tort theories and statutes related to tort. 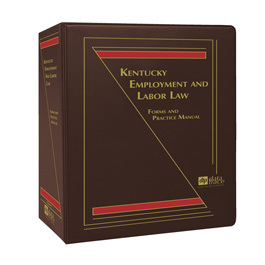 With more than 700 pages of valuable content and more than 25 electronic forms, you’ll stay current with appropriate statutes and regulations covering everything from basic employment contracts to statutory schemes in the fields of discrimination and public employment. Each chapter reviews and examines the bases for claims and defenses, expected reliefs, applicable statutes of limitations, and procedural and evidentiary issues. Also included in the publication are forms such as sample policies and procedures, and draft employment contracts and separation agreements – all of which are easily customizable in an e-form format. Recent case law concerning distinguishing independent contractor status from employment. New developments regarding limits on the application of sovereign immunity to wrongful discharge tort claims by state employees. A recent Kentucky Supreme Court decision regarding application of Kentucky’s Police Bill of Rights Statute. Recent developments regarding application of constitutional equal protection to age discrimination. Recent case law regarding a plaintiff’s burden of proof regarding an employer’s proffered non-discriminatory basis for adverse treatment, in discrimination cases. The Kentucky Supreme Court’s recent decision regarding application of the ecclesiastical-abstention doctrine in religious discrimination cases. 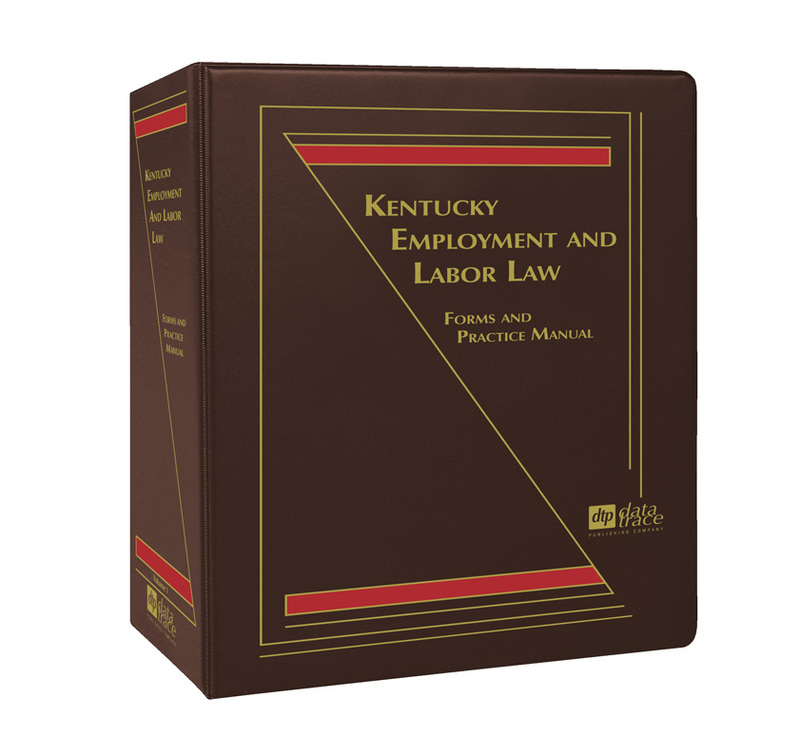 A new Kentucky Supreme Court decision regarding use of class actions in wage and hour suits. David Leightty, Esq. practices with Priddy, Cutler, Miller & Meade, PLLC, concentrating in the fields of employment, labor, and civil rights. His clients include labor unions, employees, and claimants. While Mr. Leightty has extensive experience in public labor law, including law enforcement agencies and officers, and civilian employees, he has also practiced extensively in private-sector labor law – before the NLRB, and state and federal courts. Mr. Leightty’s practice includes trials and appeals in all levels of court, administrative hearings, arbitrations, and collective bargaining. Courts and other forums in which he has practiced include multiple levels of federal court (various federal district courts, U.S. Circuit Courts of Appeal for 5th, 6th, 7th, and District of Columbia Circuits) as well as all levels of Kentucky state court (including Kentucky Supreme Court); administrative agencies at federal, state, and local levels; and arbitration under many bargaining agreements. His litigation experience entails extensive trial work including jury trials. Before returning to private practice in 1997, Mr. Leightty was Senior Attorney in charge of Litigation for the City of Louisville Department of Law. Since 2008, Mr. Leightty has been included in the “Kentucky Super Lawyers,” designated as among the top 5% of attorneys in Kentucky. He received his B.A. degree from the University of Kentucky and his J.D. degree from the University of Louisville. Alison Messex, Esq., practices with Priddy, Cutler, Miller & Meade, PLLC, representing public and private-sector unions as well as individual employees, and her practice includes administrative hearings, arbitrations, civil litigation, and appeals. Alison brings a decade of professional experience in the legal, nonprofit and political arenas to her practice in labor and employment law. She is committed to the pursuit of fair treatment and equal rights for working people and their families, including those who have experienced employment discrimination, wrongful termination, wage theft, or denial of unemployment benefits. Alison earned her B.A. in Political Science from George Washington University in Washington, DC. After returning to Louisville, she attended law school for the express purpose of practicing employment and union-side labor law. She is a 2013 graduate of the Brandeis School of Law at the University of Louisville.